"Sie haben die Musik nicht vergessen!" is a collection of traditional Pomeranian folk music which includes a variety of tunes, from haunting ballads to a rousing pirate song. Click on "Bohnen Pot" to listen to an MP3 of the song. 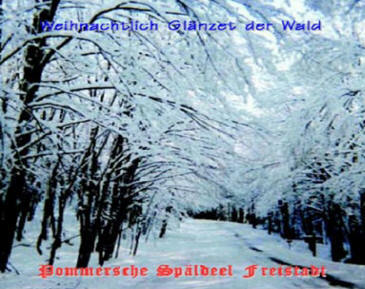 "Weihnachtlich Glänzet der Wald" is a collection of traditional German Christmas music. There are some old classics, and some that may not be as familiar, but we are sure you will enjoy them all. Click on "Lasst uns Froh" to listen to an MP3 of the song. 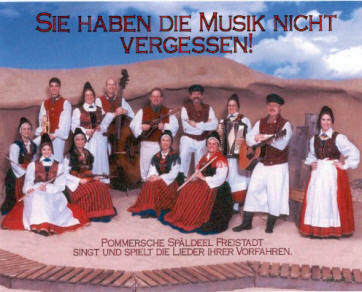 This CD was recorded and mixed entirely by members of Pommersche Späldeel Freistadt. Home-made? No, more like hand crafted. Click here to learn more! Pommersche Späldeel Freistadt, the musicians and vocalists from the Pommersche Tanzdeel Freistadt, proudly present two music collections on compact disk.